Sometimes the chickens roost on the tall stacks of rabbit cages in the barn. The top of that cage is about six feet off the ground, so it’s not surprising that I didn’t notice that one of the banty hens wasn’t just roosting at night. She’d made herself a nest on top of the empty feed bags I put up there to shelter the rabbits from any falling debris. Eventually, though, I noticed the broody hen, and in time I noticed signs of hatching. 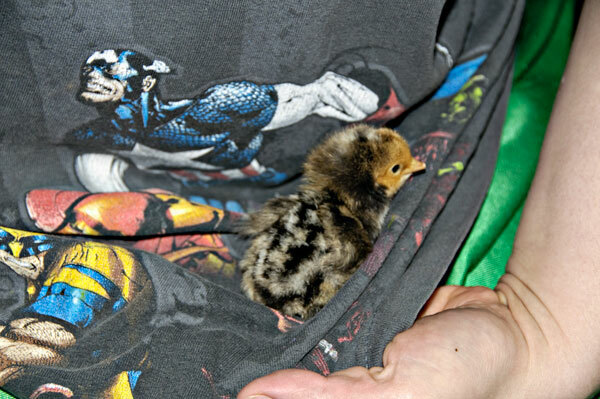 It just didn’t seem like a good place for newly hatched chicks, so we prepared to move them. Step one was a careful touch to see how much trouble Mama Hen would give us. Some of the hens are tame enough to let us handle their babies, and some are fiercely protective. This one was at the protective end of the spectrum, but not viciously so. She did puff up her feathers and grumble a warning before she bit me. It wasn’t much of a bite, not the first time. She got a bit more flesh on the second bite. I’ve been bitten, pecked, and pinched by much bigger birds, so I just ignored those little tweaks and passed her off to my daughter, who somehow managed to not get bitten at all. 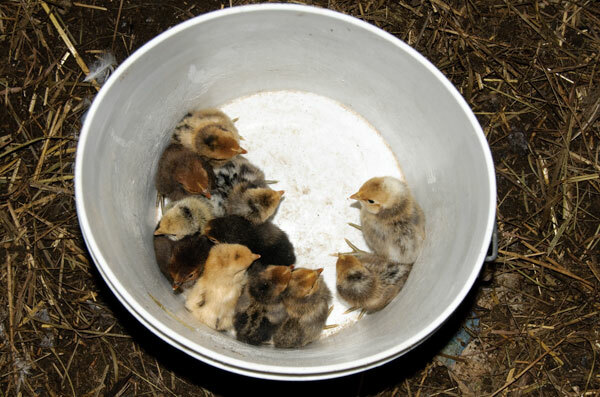 It took just a few seconds to scoop up the chicks and put them into a bucket for the move to their new nest. I love those mixed colors. 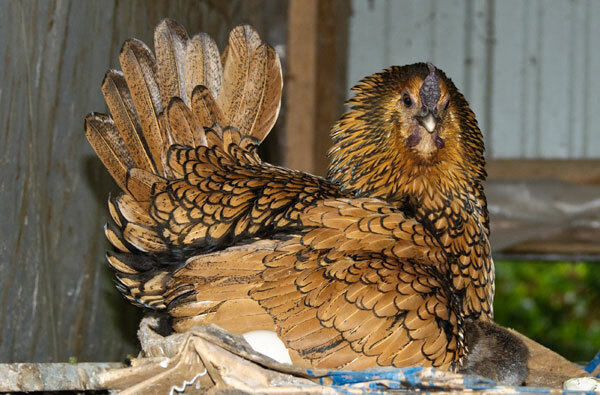 Mama hen is pure or mostly pure Golden Sebright, but from the appearance of those chicks, she consorted with a variety of roosters. 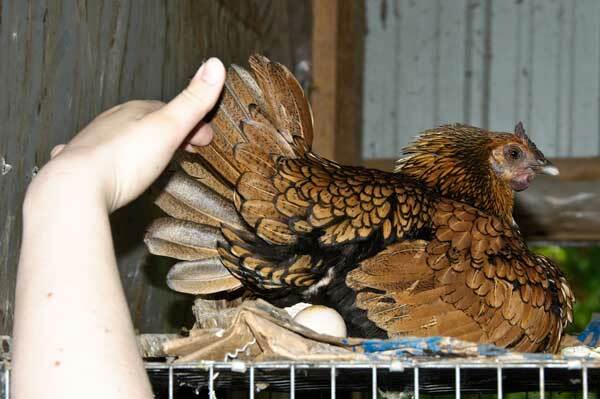 Or maybe just one mutt rooster with a variety of coloring patterns in his ancestry. Either way, those chicks are a beautifully diverse group. The new nest is a rabbit nest under a cheap plastic patio table. 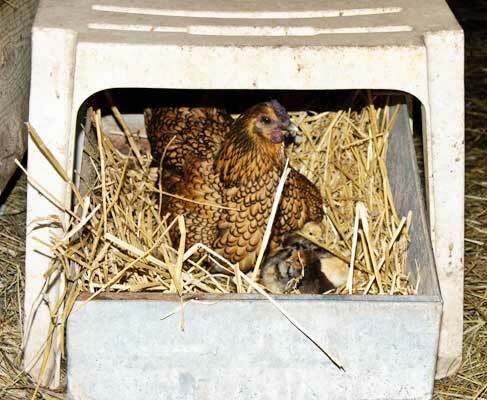 It’s cozy enough, but Mama Hen likely won’t stay there long. Hens have things to do, places to go, and very specific ideas about where they wish to settle down with their babies for the night. She may stay there a day or two, no more. It’s enough, though, for the hatchlings to steady their legs. Soon enough they’ll be strong enough to venture forth into the world, learning how to scratch in the dirt, stalk bugs, and pick out the tastiest green snacks in the barnyard. Mama Hen settled in with ten of her chicks, seeming satisfied with the nest for now. Except one chick was missing. I knew it. She knew it. There it is, tucked in the folds of my daughter’s t-shirt and under the watchful guard of Captain America and his superhero friends.